Подшла к концу эра атничных “рукопашных игр” (Рим2, Аттила, Карл). Я и мой друг Хелп решили продолжить дело Шерла с момента, где он остановился и, взяв интревью у топовых игроков доминировавших в последние 2 года, подвести черту под прерванной выходом Вархаммера эпохой античных “рукопашных игр”. Ставим целью выяснить составляющие успеха в названных играх, осветить, возможно многим знакомые, события через призму мнения и воспоминания игроков. Today I represent one of the most famous clan-less player of Total War. He is known for his victory in very first Rome2 Championship of Russia, his long fight agains TW clans, his extravagant way of communication and his "noob-boxes". Welcome Oleg. When did you start playing TW multiplayer and what TW game was it? Why ? My first game was Empire. I noticed game with war-ship on its cover and immediately bought because I loved naval battles. I had seen Rome 1 in a stores but never wanted to buy it. I hardly played Empire multiplayer - I used to lose almost all the time. Then I bought Napoleon where I had much more success. I also enjoyed that they made normal multiplayer campaign in Napoleon. MP campaign was my passion back then. I always liked battles less than campaign. I loo at battles as an addition to campaign. Tell us about your first tournament if you remember it. It is Cup of of Sichi. I played horrible but managed to win one battle by means of spam of Osman melee infantry (melee infanatry never used in Napoleon). I was always notorious for my non-standard approach. I loved to find breaches in rules that allowed to use spams, “campings” or other tricks that could help to beat stronger players. A lot of players says that clan-members should use this kind of approach but I am no clan player ! Victory is the main thing everything else is secondary ! It is Rome2 Fall Cup right after Rome2 release. It was memorable because it was a huge: a lot of strong players, big prize money so everyone wanted to win. I am learning Rome2 now and can not comprehend how you managed to reach semi-final of Rome2 Cup of Nations 2016 with Egypt (one of the weakest faction for the rule set used in that tournament) ? What is your secret ? Firstly, I like to play with unbalanced factions where I can build army around one type of units (strong elite infantry in case of Egypt). Secondly, most participants were weak. I am used to saying truth to a face to everyone. So i am doing now. They were not strong players including me. I was only surprised by Wolf Of Ichkeria who never played in tournaments before and Iraklis was strong as usual in Rome2. If I played more in Rome2 before that tournament I would contend for first place even with Egypt. Actually the only weakness if Egypt is absence of mid price cavalry and heavy spears but it makes up for those with strong melee infantry, elephants, chariots, pikes. I can not tell which was organized best but i can tell which were organized poorly. It depends if admin does what he is supposed to. All he needs to do is to set up transparent and well-defined rules. If he does this there won’t be be any tensions between players. But in reality admins set rules that they like and organize groups/play-off brackets they they like. But administrative-power is the same everywhere not only in Total War so we gotta knew how to live with it ! Vanilla Attila before last set of patches. Because I am conservative and do not want to accept changes In my opinion good game is a game where you can use any type of units to achieve victory. AoC meets this criteria but there too few units. Rome2 had too many changes after each path and similar to Attila they lost balance while doing this changes (for example they gave javs to all swords and barbarian spears and made them too powerful). What I liked about early vanilla Attila that it had working rock-paper-scissors system: infantry got killed by shock cab, shock cab got killed by melee and melee cab got killed by heavy infantry if infantry was braced. But through the set of patches CA made shock cav too powerful which rendered melee cab useless and added too many OP-units with each DLC (well they wanted to make money on this DLCs). Clans hinder development of Total War. They are need in the games where gameplay requires cooperation of multiple players. Total War is not that kind of game. 2x2 battles/tourneys are very rare. Clans could be useful to find practicing partners but most of the time they serve purpose of organizing unfair conditions for victories of clan members: “gifting” points in round-robin tournaments; sharing replays while others do nat have access to them etc. My advise: better find friend in real life than friends in Total War clans. I remember a lot of battles. Especially from Shogun2. Even about Rome2 and Attila battles I can type text worth of 10 pages. Here are a few battles from the top of my head. 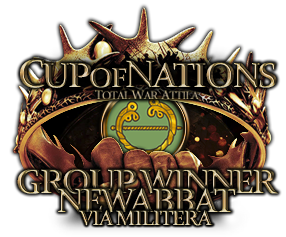 Battles against Orgetorix in Rome2 Fall Cup: I said publicly before the battle that I should pick nomads (faction without infantry), everyone laughed at me, I picked them and won. This changed whole match because opponent got demoralized and did not know what to do and what army take for next battle. 2 battles from Rome2 Barbarian Warlord tournament: I did not have DLC which gives most OP factions and units so I was in inferior position to everyone in that tourney. So I had to “surprise” them. In first battle I took 4 chariots for Iceni (admin forgot to limit them) and run all his infantry spam into the ground. Opponent started bitching that I am a cheater but It was tuna an I enjoyed because if someone called you a cheater then that means you played very well. In second battle I picked Suebi against Iceni, composed army with weak units but all those units gave moral debuff to enemy and general with intimidating ability. In first minute of the battle I poured firing missiles into enemy attacked with units that scares and used general ability. All these routed enemy off the field. It was one of the shortest battles I’ve ever had. Interesting that I never for anyone used similar tactic. Battle against Alesar during first Rome2 Cup of Nations. Several patches came our during the course of the tourney and every patch changed balance. In first battle I destroyed his Parthia with Spartha then patch came out, we played another battle and he won me with Parthia without single chance for me. But I can not refrain from mentioning Shogun2. Everything was different back then. Players had to take terrains into account which resulted in a lot of fun tactics like ninja ambushes in trees. One valley from fuse rifles could change course of the game by destroying enemy elite unit. I like playing against Llewelyn of Agartha. We play often and then discuss outcome. We do it for fun or as a training for tournaments. Tournament battles are not always most interesting battles. If top player makes a goal to become top in another TW title he will achieve it. But everyone has own quirks. For example I do like units with big axes and high charge bonus. I do not like playing with them so I play them rare so I do not understand them well so I started losing in Attila when they got buffed to OP level with latest patches since it is become extremely difficult to counter them. IMP-Sherl is ok but talks too much. There are few good you tubers in TotalWars. They either talk too much or talk something unrelated or … they have unpleasant voice (but usually you can get accustomed to it). But we gotta live with it since video without comments is too boring. No I do not and I think it is a cheat. Micro-Control is always useful but I think army roster selection is most important thing. 50% of battles are won at that stage. Another 30% at army deployment stage and first army move and only 20% is everything else (micro). But effective army compositions are known when game has been played for long enough so micro becomes more important. Moreover there are universal tactics which are almost impossible to counter and a lot of players use them thinking that they have better micro or just don’t want to risk with non-standard army/strategy. I am good at composing my armies and picking strategy for upcoming battle. I already gave example of such battles in previous questions. In addition to that I know which unit is stronger and if enemy line consist of different units (for example mid sword-elite sword-mid-sword-) I notice it and set up my units the way that allows me to know where my units will win and where they will lose so that I could place reserves or cav nearby to take advantage of gap in enemy line. Rush. My nerves are not very strong and I do not have a lot of patience required for kiting or balance (to less extend). When you rush battle outcome is decided in first minutes which is perfect for me. Also I am good at composing my army and I believe army composition plays more important role than micro-control in rush. Heroes of Spartha from Rome2 or Noble avar swords from AoC. I love expensive elite units which you can take just a few. They are “epic”. It is not about them being efficient, it is about their “vibe”. I also loved Great Guards from Shogun2. I play tournament battles for victory. If i just want to play for fun i go to random battle or invite friend. I wash my head - joke of course. If opponent is strong I practice with my friend. Go through possible strategies. Study maps if there are terrains on them. Sometime I watch replays but it happens very rare because playstyle of all top players is known. Quick battles with rating system from CA but the game needs to balanced first for that. This is the only way to attract a lot of player and find best. In current situation tournaments attract the same small group of “enthusiasts” while a lot of talents might have gone to other games. Also for every tournament before it begins players can be decided into 3 groups: newbees (non-contenders), veterans who came back because of nostalgia (non-contenders), contenders (usually 2-3 people). I never played and don’t plan playing it. I am against fantasy in historic game like Total War. Also this game is too expensive. Последний раз редактировалось deve; 24.08.2016 в 17:58. Сегодня я представляю вам одного из самого известного и титулованного без кланового игрока. Известного победой в самом первом Чемпионате России по Рим2, борьбой с кланами, экстравагантной манерой общения и своими "коробками" . И так Олег "нуп без клана". В России я живу, в Питере, образование у меня высшее, и я уже так сильно постарел с момента начала моих побед в Тотал Варе, что теперь скорее могу считаться старым ветераном)). В Эмпайр. Увидел на полке диск с кораблём на упаковке, и купил - безумно люблю морские сражения. Рим первый тоже видел много раз до этого, но не стал покупать. В мультиплеер в Империи почти не играл, начал только с Наполеона, который уже купил с самого выхода и в коллекционном издании, и там стало лучше получаться - в боях Эмпайр я почти всегда проигрывал. А ещё в Наполеоне сделали норм работающую сетевую кампанию - это была моя страсть). Сражения я всегда любил куда меньше, чем кампании. Сражения для меня - дополнение к кампании. Кубок Сичи по Наполеону хз какого года. Запомнился тем, что играл я там отвратительно, но сумел выиграть один бой, используя спам османских янычар-рукопашников(прим. - в Наполеоне практически никогда никто не использовал отряды ближнего боя вообще). Я всегда отличался тем, что любил использовать любые нестандартные подходы и находить лазейки в правилах, позволяющие использовать спамы/кемперские тактики и побеждать более сильных игроков хитростью. Многие считают это нечестным и недостойным клановых игроков, на что я отвечаю, что я и не клановый игрок!) Победа - это самое главное! Из тем, что прошли по Риму и Атилле - это был турнир Фолл Кап по Риму 2, кажется, в самом начале его выхода, потому что он был реально огромным по количеству, там было много сильных игрокоа, большие призовые и все очень старались выиграть. Самый интересный турнир. Я вот щас учусь играть в Р2 и не могу понять как ты умудрился Египтом (одной из слабейших фракций по тем правилам) в последнем КоНе по этой игре пройти так далеко? В чем секрет ? Ха-ха)) Я не считаю, что он был так слаб. На самом деле причин было несколько: я вцелом люблю играть несбалансированными фракциями, делая упор на что-то одно(в данном случае - сильную пехоту). Второе - говоря честно, все участники были очень слабыми. Я привык всегда всем говорить правду в лицо, и так оно и было. И я сам тоже был очень слабым. Удивительным оказался уровень Волка Ичкерии, ранее не выступавшего на турнирах, а также как всегда в Риме Два оказался силён Грек Ираклис. Если бы я больше играл в Рим в последнее время, то считаю, что мог бы претендовать Египтом на победу: единственная его слабость - нет средней кавалерии, зато сильных сторон очень много: пехота, слоны, колесницы, стрелки, пики и т.д. Атилла до последних патчей). Потому что я старый консерватор и не имею принимать новых изменений)). По-моему хорошая игра та, где можно использовать для победы все виды войск - Карл такой, но в Карле их просто слишком мало, в Риме 2 было слишком много изменений с каждый патчем, в итоге, как и в Атилле, мне кажется, что правильный баланс разработчики пропустили, сделав слишком мощными бросаемые пиллумы. В Атилле мне нравилось то, что хорошо работала система камень-ножница-бумага: можно было легко уничтожать пехоту ударной конницей, но её легко побеждала рукопашная, в свою очередь тяжёлая пехота хорошо(относительно хотя бы) держала натиск рукопашной кавы. Но затем ударную конницу сделали слишком мощной, а рукопашную - почти бесполезной. К тому же ввели кучу имбовых юнитов за фракции-длц в погоне за деньгами. Это моё имя) Я сами не догадались?) Я выбор обсловлен моей плохой фантазией, вот и всё))). Таких много, но я больше помню Сёгун!) Но рассказывать про все интересные бои даже в Риме и Атилле - можно на 10 страниц. Вспомню бой с Оргеториксом на Турнире Фолл Кап: я ещё перед боем сказал, что возьму кочевников(фракцию без пехоты), над чем все смеялись, но я их взял и победил! И это переломило ход всей партии БО5, т.к. Думаю сильно его дизморальнуло, когда он вообще не понимал, что против них делать. Помню бои с Алесаром на первою кубке наций - с каждым патчем баланс менялся на противоположный, вначале я Спартой раскатал в хлам его Парфию, а потом он меня так же без шансов после патча))). Но всё равно скажу, что в Сёгуне всё было иначе: почти множество боёв, где игроки играли от рельефа, где ниндзя из леса со всех сторон окружали противника и буквально появляясь из невидимости уничтожали гораздо более многичесленного и сильного противника. Как единственный залп из фитильных ружей мог повернуть игру, уничтожив элитный отряд противника. Таких боёв было иного больше тогда. Грек Ираклис - это топ в Риме 2. Он непобедим. Единственная его слабость - кроме Рима 2 он в Тотал Варе не играет или играет плохо. Волк Ичкерии мастер из новичков. Ещё очень сильны игроки клана ВОД и их твинки))). Мне нравится играть с Ллевелином из Агарты - мы с ним часто играем, потом обсуждаем результаты. В основном по фану или тренировка к турниру. Не всегда именно турнирные бои самые интересные. Если очень сильно захочет - станет топом. Но у большинства есть свои личные “тараканы” в голове, которые не позволяют: например если я неприемлю юниты с большими топорами и высоким натиском, мне очень неприятно ими играть, поэтому я играю ими мало, поэтому их не понимаю и стал много проигроывать в Атиллу, когда их ещё усилили с патчами. Замкнутый круг. А контрить их очень-очень сложно. Шерл ничего, хотя много болтает и сильно видео на новичков рассчитано. А вообще хороших стримеров по Тотал Вар очень мало. Либо мало говорят и не по делу, либо говорят глупости, либо неприятный голос(хотя к последнему можно привыкнуть). Видео без комментариев же смотреть не люблю - скучно. Быстро. Чем больше ты играл в предыдущую игру, тем быстрее пойёшь следующую. Всё просто. Хотя у каждого есть свои личные предпочтения и стиль игры, которые помогут - если любишь играть от кавы, а в новой игра кавалерия сильная и хороша - то тебе сразу будет легко). Думаю понятно, о чём я говорю). Микро контроль полезен всегда, но главным считаю набор состава. 50% боёв выграно ещё на этапе набора, ещё 30% - это расстановка перед боем и правильный первый ход, и лишь 20% - это остальное. Но когда игра уже долго играется, то все составы и тактики становятся известными, поэтому роль микро повышается. К тому же есть универсальные тактики, которые сложно или невозможно сконтрить - обычно такими пользуются игроки, которые заведомо считают себя сильнее соперника и не хотят рисковать с составом. То ставлю свои юниты каждый напротив каждого таким образом, чтобы заранее видеть, где будет поражение, а где победа, чтобы заранее знать, куда придётся подвести резервы, а где создать прорыв кавалерии, куда послать стрелков. Раш. У меня слабые нервы и я не могу долго стабильно играть, чего требует кайтинг или баланс. В раше же всё решается в первые пару минут. К тому же считаю, что в раше более важен состав, чем контроль, а я считаю себя сильным именно в первом. Герои Спарты. Потому что я люблю элитные, дорогие отряды, которых мало, но они ЭПИЧНЫ. Дело здесь не в эффективности, а просто в духе. Так в Сёгуне мне нравилась Великая Стража. На результат в основном. Зачем участвовать, если не хочешь победить? Если просто хочу поиграть - я иду в рандом или приглашаю кого-нибудь из друзей. Турниры только ради победы или хотя бы попытки победить. Если соперник силён и хочется выиграть, то обычно тренируюсь с товарищем, смотрим разные составы и тактики, в т.ч. По использованию фракций и карт. Повторы иногда тоже, но довольно редко. Обычно стиль игры всех известных игроков известен, поэтому большого смысла в повторах я не вижу. Ещё всегда делаю себе чашку чая перед боем - в тотал варе бои долги, набирать состав тоже долго, а чай очень люблю! Только быстрые бои от СА с рейтингом и балансом. Только так можно вовлечь действительно многих игроков и узнать лучших, иначе все остальные турниры - это развлечение для десятка интересующихся, а настоящие таланты пропадают и уходят в другие игры. А у нас зачастую ещё на этапе регистрации всех игроков можно разделить на 3 группы: новички(слив), старые ветераны пришли вспомнить былые годы(слив), претенденты(обычно 2-3 человека). Не расстраиваться, даже если тебя 10 раз подряд победит один и тот же соперник. Очень многие самое начало не выдерживают и начинают говорить о читерах и т.д. Всё не так. Нервы свои берегите, вот и всё. В жизни пригодятся). Не играл. Категорически против Фентези в Тотал Варе, к тому же игра неоправданно дорогая. Последний раз редактировалось deve; 24.08.2016 в 17:57. Последний раз редактировалось deve; 24.08.2016 в 10:25. О каком таком самом первом кубке наций речь??? Дык, а кто же такой гуссар из CW? Вот этот самый прикольный из тех, что был. Приятно читать о людях, которые своим примером показывают, что для достижения результатов есть разные пути, в его случае игра составами, это я очень люблю, для меня нет ничего приятнее выиграть бой ещё в его начале. Это совсем не зрелищно, но классно, когда ты готовишь тестишь юниты и вчитываешься в циферки, хотя на это и нужно много времени и часто как то лень. Приятно слышать его правду матку и о кланах и о камере. Вообщем, хоть и в силу понятных причин никогда не слышал о нём и его достижениях, но интервью суперское. П.С. на моменте когда я читаю всё ещё много опечаток. Последний раз редактировалось Irongeneral; 25.08.2016 в 14:23. Относительно кланов моё мнение такое, что они несут чисто организаторскую основу. То есть ты быстрее получаешь инфу о турнирах и тд. Потом возможно и сам уже знаешь, где, что искать, но как мне кажется многие новички отсупаются на этом моменте. Конечно говорить, что только в кланах самые сильные игроки неверно. И мне кажется ценны прежде всего люди, которые обыграв на каком нить турнире "очередного нуба" не пройдёт с покерфейсом дальше, а поговорят с ним и возможно такой игрок останется в нашем сообществе и со временем станет активным его участником. Последний раз редактировалось Irongeneral; 24.08.2016 в 23:59.
пора брать интервью у железного женераля... столько мыслей!